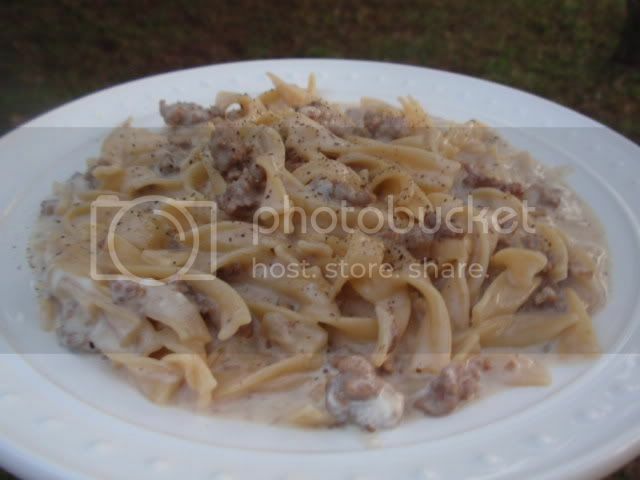 This beef stroganoff recipe is quick and easy and perfect for a week night meal. It's a great leftover, too. Heat a large saute pan with lid over medium high heat. Add the oil and, once hot, the ground beef. Add the onions. Stir, breaking up the ground beef, until the beef is browned and onions are tender. To the skillet, add a small pinch of salt. Add the brandy and lift any browned bits from the bottom of the pan. Boil for about 1 minute before adding flour. Cook for 30 seconds; then, add the broth and bring to a boil. Stir in the noodles. Cover partially with a lid and cook, stirring occasionally, until noodles are tender, about 10 minutes.